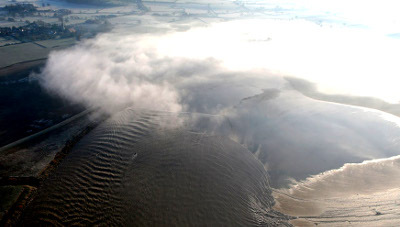 THIS year is going to be a good year to see the Severn Bore with massive bores in the offing. The famous natural phenomenon is in for a good year with three five star bores and 16 four star bores predicted for the coming months, many taking place during daylight hours, Alan Tilbury reports. The Severn Bore is famous throughout the world, as it surges up river rising to form a wave, with a strong bore reaching as far as Tewkesbury Weir. Predictions are based on spring tides, when the height of the tide at Sharpness is approximately 9.5m, though a bore can establish on all tides above eight metres. Friday 22nd March, starting at Newnham at 08.46, reaching Over Bridge by 09.28. Tide height of 10.3 metres. Sunday 29th September, starting at Newnham at 20.28 and reaching Over Bridge by 22.03. Tide height of 10.3 metres. Monday 30th September, starting at Newnham at 21.10 and reaching Over Bridge at 22.45. Tide height of 10.3 metres. The largest of the three star bores taking place during day are listed, though the several four star bores all take place at night time so are not shown. Thursday 21st February, starting at Newnham at 08:11, tide height of 10.2 metres. Friday 22nd February, starting at Newnham at 08:52, tide height of 10.2 metres. Thursday 21st March, starting at Newnham at 07:10, tide height of 10.0 metres. Saturday 23rd March, starting at Newnham at 08:32, tide height of 10.0 metres. Monday 30th September, starting at Newnham at 08:53, tide height of 10.0 metres. Monday 1st October, starting at Newnham at 09:32, tide height of 10.0 metres. Tuesday 29th October, starting at Newnham at 07:29, tide height of 10.0 metres. Bores are a tidal surge that runs against the flow of the river and are concentrated on the days immediately following the new and full moon. A true bore is a wave which measures above 9m as it passes Sharpness. Two popular places to see the Severn Bore are at Telford Bridge at Over also a good viewing spot at Minsterworth. But be wary of watching on the riverbank as the wave can breach as it passes.